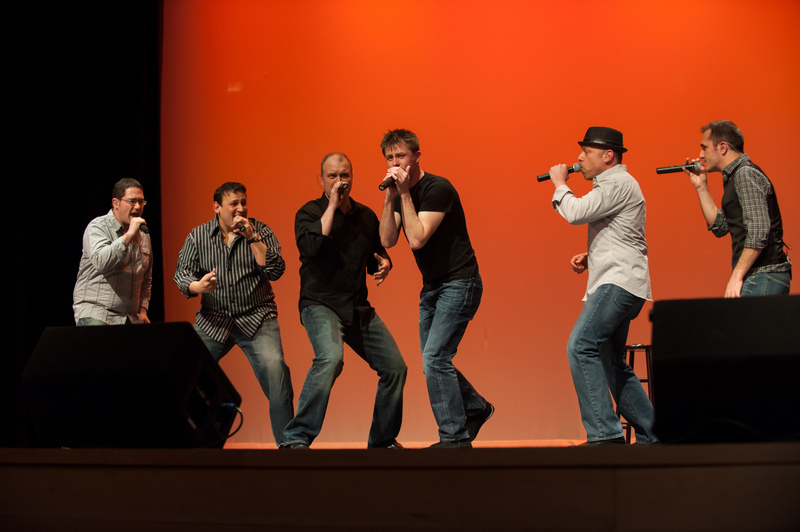 Saturday May 25th, 2019: Five O’Clock Shadow, the award-winning a cappella group, will perform a benefit concert for the Lakes Region Visiting Nurse Association, a New Hampshire-licensed home care and hospice agency that offers a full range of services in the comfort of your home. and harmonies, while exploring instrumental mimicry and creating unique textures that excite, entertain and inspire audiences of all ages. Throughout its 23 year history, Five O’Clock Shadow has redefined the possibilities of vocal effect processing and innovative writing and its critically acclaimed live performances and recordings. What’s more, these guys love what they do, and their joy is contagious! Five O’Clock shadow effectively blurs the lines between traditional a cappella singing and today’s mainstream audio. From the United States to Europe and Asia, audiences have been witness to the revolutionary form of all vocal music that is Five O’Clock Shadow. Now you can witness it too! Lakes Region Visiting Nurse Association has been serving the Lakes Region area since 1923 offering a full range of home care and hospice services as well as rehabilitation services, personal care services and wellness and community programs which are designed to promote the health, safety, and mental well-being for their clients through numerous clinics and support groups. Each year the LRVNA provides approximately 20,000 annual visits to residents in the comfort of their home. Service areas include Alton, Center Harbor, Gilford, Laconia, Melvin Village, Meredith, Moultonborough, Sandwich, Tuftonboro, Wolfeboro. For more information visit their website www.lrvna.org. All We Care concerts are held at the Inter-Lakes High School in Meredith. By purchasing a ticket for $27.50 you will enjoy great music, food, and drink while supporting local agencies that provide vital services to the Lakes Region community. Complimentary snacks and desserts can be enjoyed at 7:00 P.M. and the concerts begin at 7:45 P.M.
Bayswater Books located at 12 Main St. in Center Harbor. We Care thanks our 2019 event sponsors, Miracle Farms Landscaping, Cantin Chevrolet and Golden View Health Care for their support. Holiday Greetings from Rabbi Boaz!